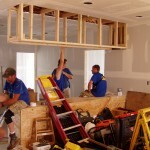 Call for a free quote: 865-382-0730| Installing Nationwide & Serving East & Middle TN and Central FL. 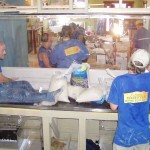 It was June 14, 2005 when an “Extreme Makeover” producer called us to see if we could supply a wall-size aquarium in two weeks for the Rodriguez home. They wanted the tank because the two young Rodriguez daughters are fans of the film “Finding Nemo.” Someone with “Extreme Makeover” had seen one of our Indoor Oceans aquarium custom design and installation ads in a magazine for builders. Indoor Oceans was up for the challenge. 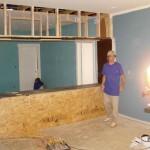 The 600 gallon built-in saltwater aquarium planned, designed and installed in only 14 days (a project that normally takes three months from inception to installation), was a focus of the Clarksville home “Extreme Makeover” renovation. 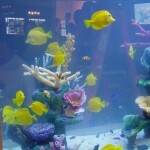 The custom salt water aquarium system included 147 colorful marine fish and artificial coral inserts. The entire team at Indoor Oceans was honored to give back to the family of injured Iraqi war veteran Master Sgt. Luis Rodriguez. 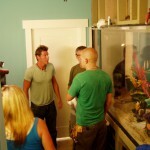 The end result was a spectacular underwater reef experience that was the family’s favorite feature in the home makeover. In fact, one of the “Extreme Makeover” producers described it as one “the most extreme project we have ever done.” The entire Rodriguez family, especially the girls, loved their custom saltwater aquarium and we were thrilled to serve them in this way. 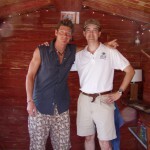 Ty Pennington yells through his megaphone at Indoor Oceans crewmember Kathi Drouillard and Kent Morrell, on ladder, as they put the finishing touches on the aquarium. 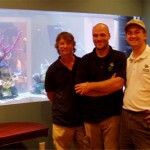 Kent Morrell, founder of Indoor Oceans (right), stands in front of a custom saltwater aquarium with technicians Stuart Weed (left) and Jason Oaks (middle). Jason Oaks, with Indoor Oceans, climbed into the aquarium to place custom artificial reef inserts in place before the water was added. Happy, healthy fish cruising around their new underwater home by Indoor Oceans in the Extreme Makeover Rodriguez residence. 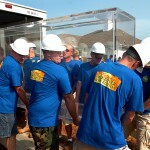 Extreme Makeover: Home Edition workers move a custom 600-gallon aquarium by Indoor Oceans into the home they are working on in Clarksville, TN. 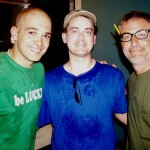 Designers Ed Sanders (L) and Paul DiMeo (R) with Indoor Oceans President, Kent Morrell (middle), pause for a photo during the Rodriguez home makeover. 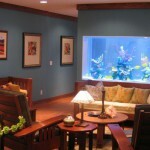 Contact us today to enhance your home or office with a stress-reducing custom aquarium by Indoor Oceans.